The village of Idomeni in northern Greece was a key transit point for refugees travelling from the country to northern Europe last year. 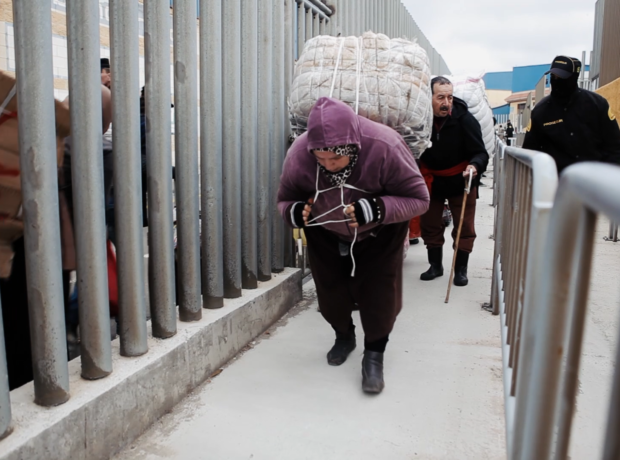 When Macedonia closed its border and built a fence to prevent people crossing, thousands were left stranded in the village. 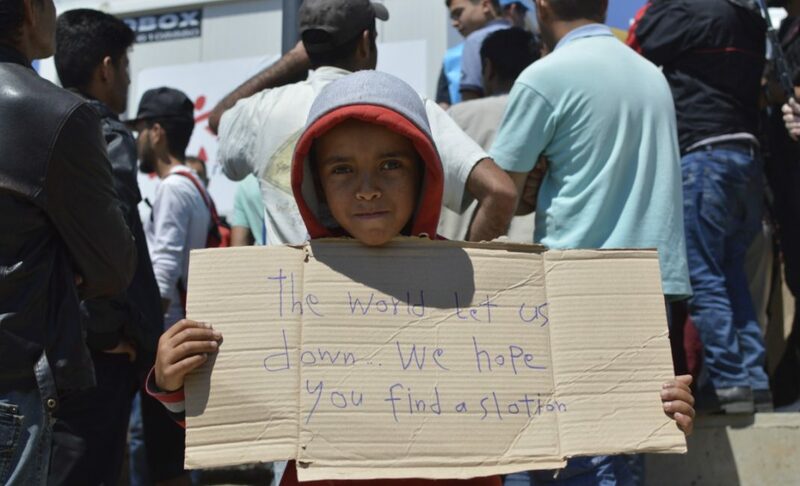 It soon became Europe’s largest informal refugee camp. 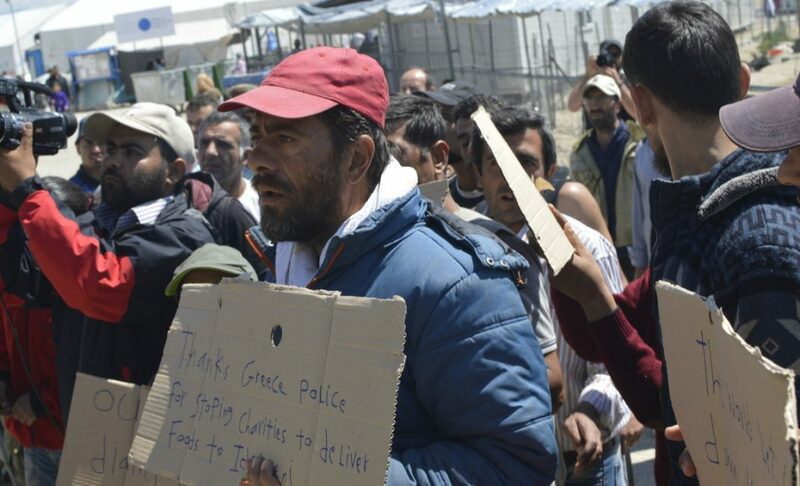 In May the Greek government began the evacuation of the camp. Journalist and photographer Dario Sabaghi witnessed the final days of the camp and interviewed soon to be evicted residents. 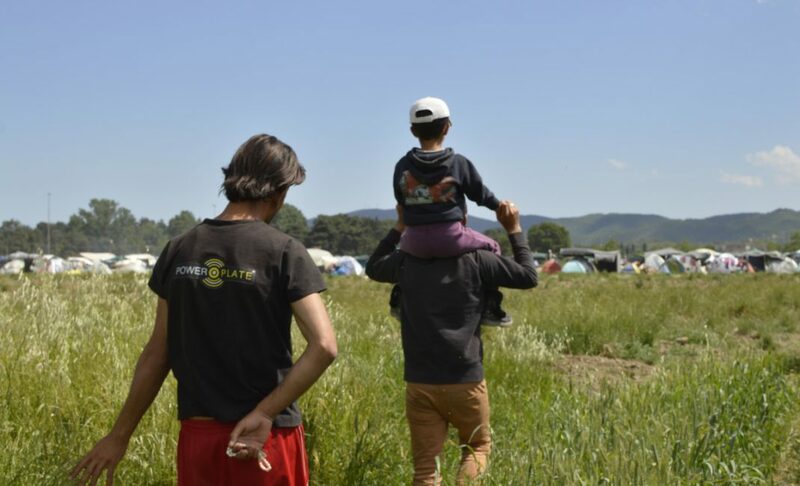 By the end of 2015, it had become increasingly difficult for refugees to enter Europe through Bulgaria from Turkey. The land border between the two countries had been one of the safer routes, less deadly than crossing the Aegean Sea from Turkey’s western coast. However, the Bulgarian government soon tightened security and began building a 100-mile fence to cover its entire border with Turkey. This followed the barbed wire fence built on Greece’s land border with Turkey back in 2013, completely fortifying the area where the three countries meet. One effect of this was to divert refugees to Turkey’s western coast to places like Izmir, and across the Aegean Sea to Greece’s islands. Many thousands drowned. The survivors arrived in Greece and continued their journey to northern Europe by land. A popular route was through Greece’s northern border with Macedonia. In particular, refugees would pass through a small Greek border village called Idomeni, a short distance from Macedonia. But after a hot summer of clashes between refugees and armed border guards across Europe, the Macedonian government began constructing a fence on its border with Greece, to be guarded by police armed with taser guns. With another border closed, thousands of refugees were left stranded in Idomeni, unable to move forward and reluctant to move backwards. 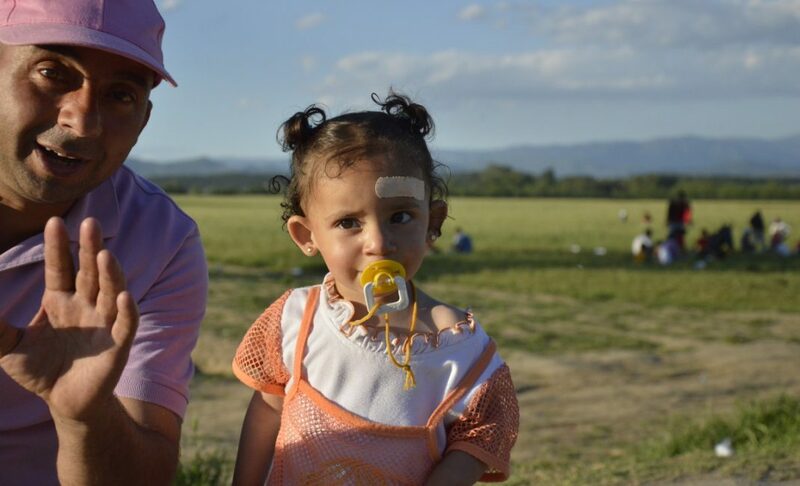 By the end of 2015, a refugee camp had sprung up in Idomeni, home to men, women and children from across the Middle East and North Africa. At one point more than 10,000 refugees found themselves in the area, hopeful that the border might reopen. 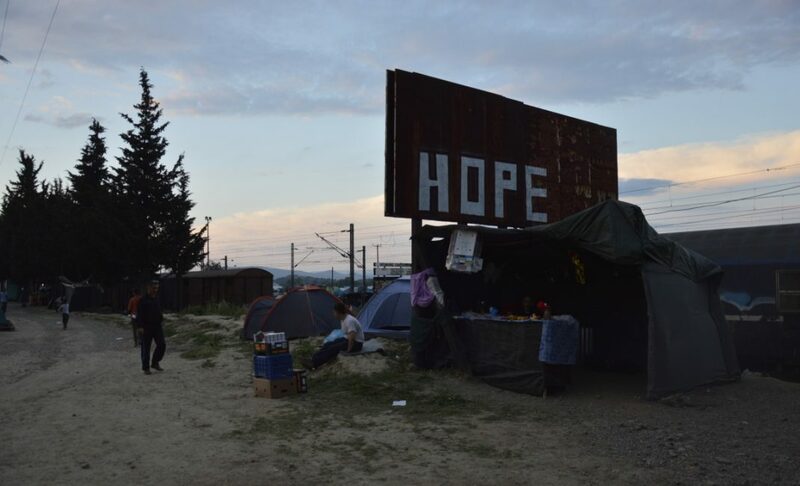 Sympathetic European citizens from countries such as Germany, Spain, Britain, also flocked to Idomeni with donations of food, clothes and tents for shelter, and to offer legal advice, counselling and general solidarity. 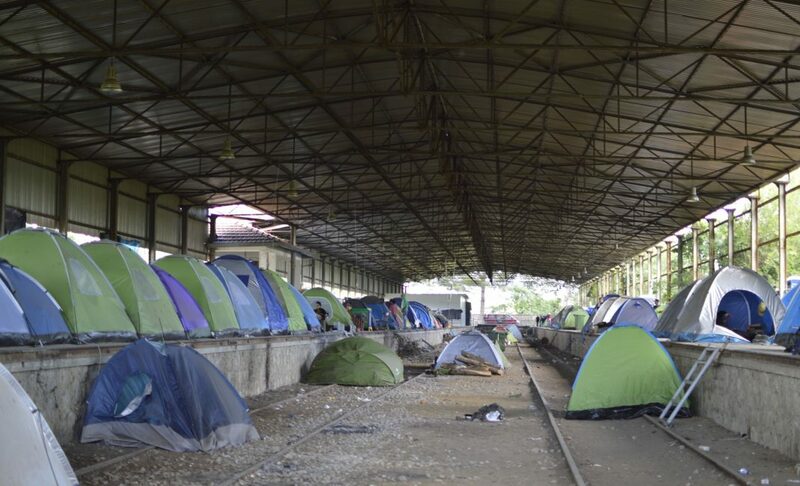 This sense of community created by the influx of volunteers was something the Greek government wanted to limit, so that the camp wouldn’t become permanent. 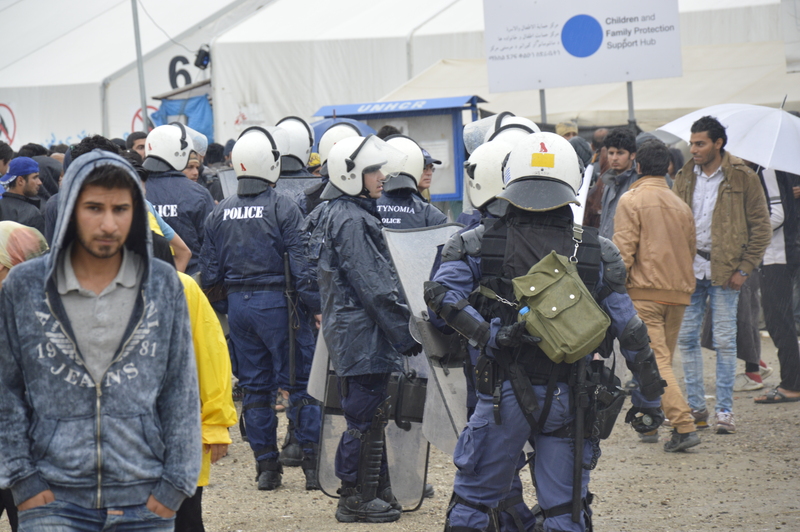 It actively sought to prevent activists, volunteers and journalists from reaching the camp in Idomeni. 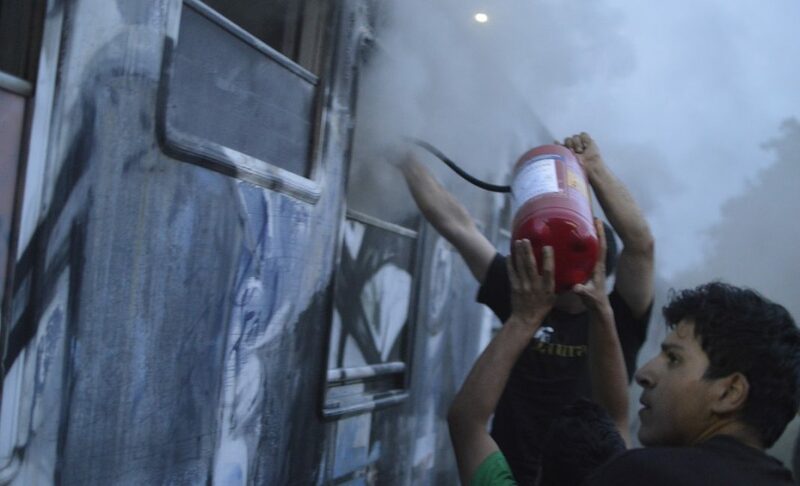 The situation came to a head on 18 May this year, when there were clashes between some refugees and Greek police. It started when a small group of refugees took control of an empty train wagon and pushed it toward the Macedonian border. They were stopped by Greek police, who fired tear gas and stun grenades at them. NGO volunteers temporarily left their spots in the camp because of tear gas and some refugees were wounded. 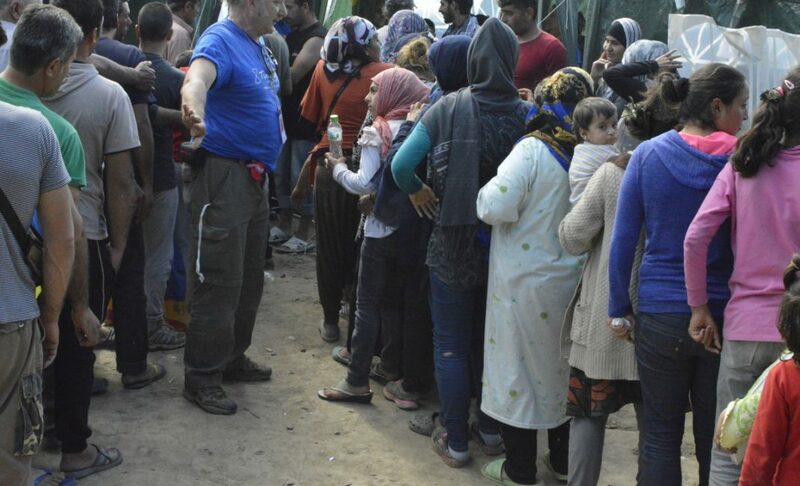 From then onwards the Greek government imposed strict controls on civilians visiting the camp and sped up plans for the evacuation, due to take place late in May. The Greek government declared Idomeni a military zone. I travelled to the camp in Idomeni two weeks before the evacuation started and around the time Greek police began to turn away volunteers and visitors. 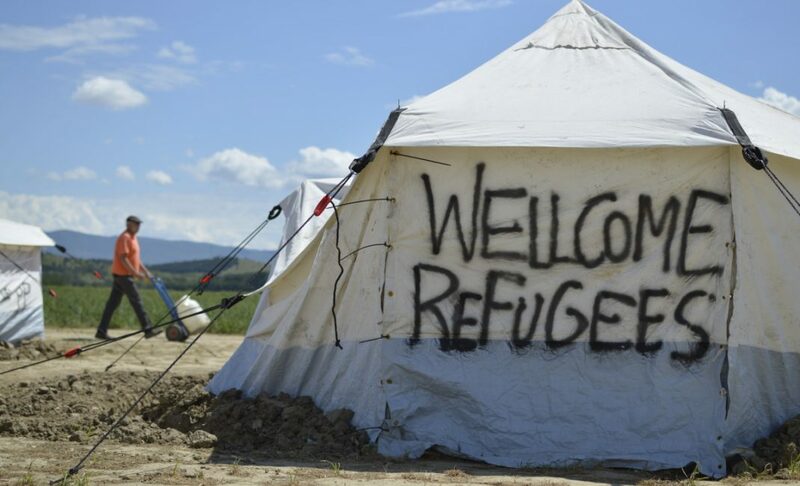 The camp was a short walk from the Macedonia-Greece border, and 86km from Thessaloniki, the second largest city in Greece. 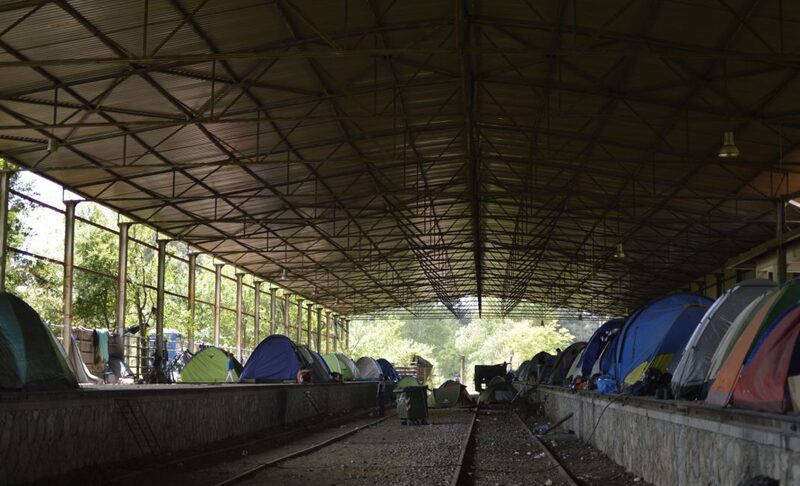 Idomeni has a railway station, where many refugees took shelter. Close to the station, there was an abandoned hangar where a group of mostly Kurdish refugees lived. Half of refugees at Idomeni were Syrian, but there were also Iraqis, Pakistanis and Afghans too. To enter the camp I needed an alternative way in, to avoid the checkpoints on the two main roads leading to Idomeni. Along the way, I met three volunteers also trying to get to Idomeni. One was a tall, American man, who had come to Greece to help refugees by volunteering as an entertainer. The second was a woman from Switzerland who wanted to volunteer as a doctor. It was her first day in Greece and she was looking for some NGOs to join and wanted to visit Idomeni before the evacuation. 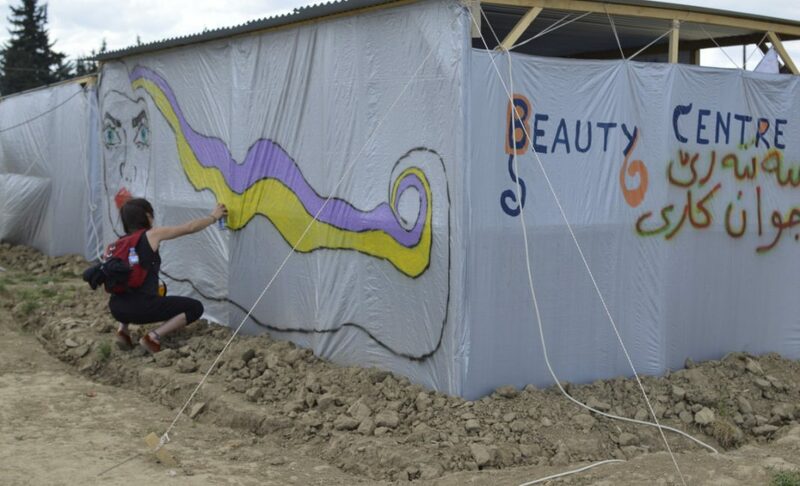 The third volunteer was a red-haired girl from the UK who had spent three weeks in Greece volunteering as a nurse. Her plan was to donate medicine to the camp. We attempted to reach the camp on foot, walking through the open fields of the countryside, bypassing the guarded road entrances. 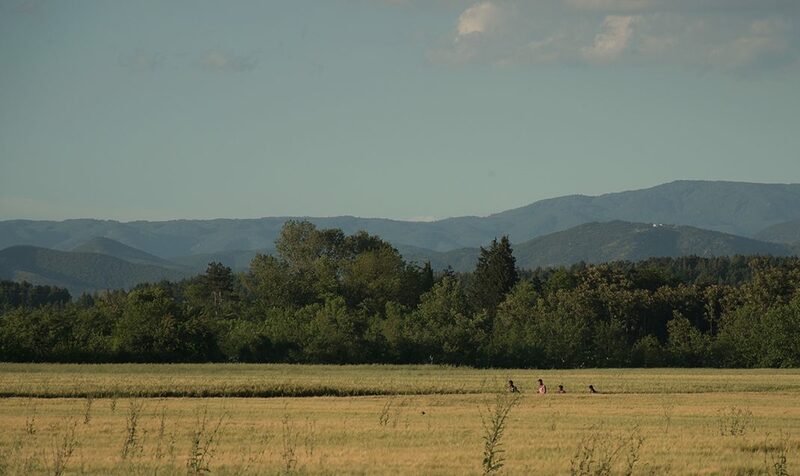 Our plan was to cross the Vardar, the 388km-long river which forms part of the Macedonia-Greece border. As we walked through sheaves of wheat and weeds, suddenly we heard the buzz of a helicopter above us. “Under the tree,” I said to the others. We hid ourselves near some thick bushes until the propeller noise disappeared behind us. Half an hour later, we finally reached the mouth of the Vardar river, but found it too wide and too deep to cross. Demoralized, we made our way back to Polikastro, another village about 24km from Idomeni. Here I met two journalists from Melilla, a Spanish autonomous city located on the north coast of Morocco, also planning to report on the evacuation. We tried a secondary road via Auxioupoli, another nearby village, but even there the police stopped us. This particular route was well trodden and the police were prepared. Ahead of us, a group of volunteers from the Spanish fire service had been stopped for the same reason: no way in to Idomeni. When we turned up, one of those volunteers, a woman of around 30, was giving a massage to a sunburned stocky police officer with an emollient cream. He complained loudly of aches and pains every time he moved. The girl caught my eye, continued the massage and smiled. Her expression suggested she was trying to soften the police officer’s stiffness, in the hope that he would let us pass. As the police officers’s pain diminished he said, “Stay here, I go to talk with my colleagues to convince them to let you pass. It’s not sure, but I try”. We all thanked him. After a few minutes, he returned to us with several sheets of paper. “Listen guys. You are not registered in this list, but if you get in touch with one of these listed organizations and work with them, you are allowed to get in the camp.” These organisations were permitted to enter the camp and provide refugees with basic supplies before the evacuation. We looked at the paper. Around 60 organizations were listed, such as UNHCR, Doctors Without Borders, Samaritan’s Pursue and Praksis. We drove away to try our luck on the second entrance into Idomeni, where a checkpoint had been set up on a bridge. On our approach, a police officer with black sunglasses pulled us over and asked for our passports and the names of the organizations we worked for. We were quiet for a while, then mumbled something about working as teachers in the camp’s cultural centre, and pretended to misunderstand the police officer’s Greek accented English. Our conversation consisted of gestures, we pointed towards the camp, which was just one minute beyond the checkpoint of the bridge. Blasco, one of the two journalists with me, a wild-bearded, burly man with glasses and a Basco hat, named a Spanish organization that he noticed on the list that we had read before. The police officer conferred with his colleagues. He gave us back our documents and waved us through. We were finally on our own way into the camp. The Idomeni skyline had changed again. Two days before our arrival, a fierce rainfall soaked the camp. 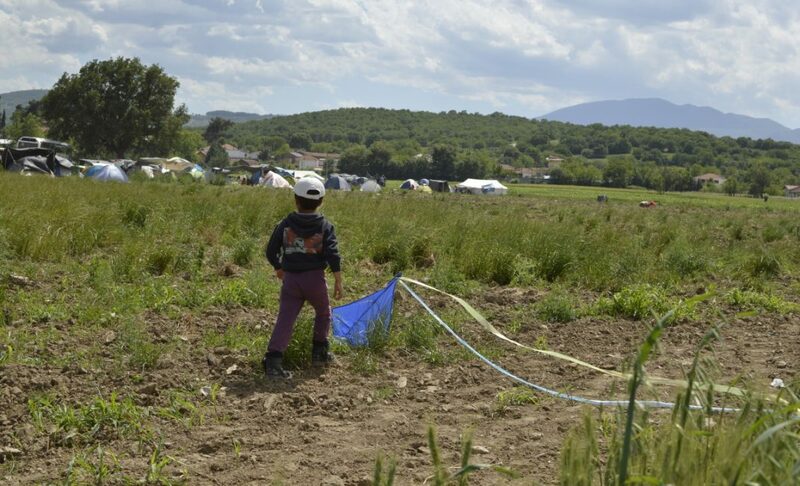 The flimsy tents given to refugees had barely survived, living conditions were desperate and some refugees had started to leave the camp before the impending eviction. Daily buses carried people from Idomeni to a military camp at Oreokastro, a town near the city of Thessaloniki. But for most of the refugees the thought of leaving Idomeni for this other camp was terrifying. A military refugee camp is a closed area where refugees live and it is managed by Greek police with the support of some NGOs. People come and go as they please and it appears safer than an unregulated camp, but at the same time, it is closed to the general public, and open only to a few NGOs. 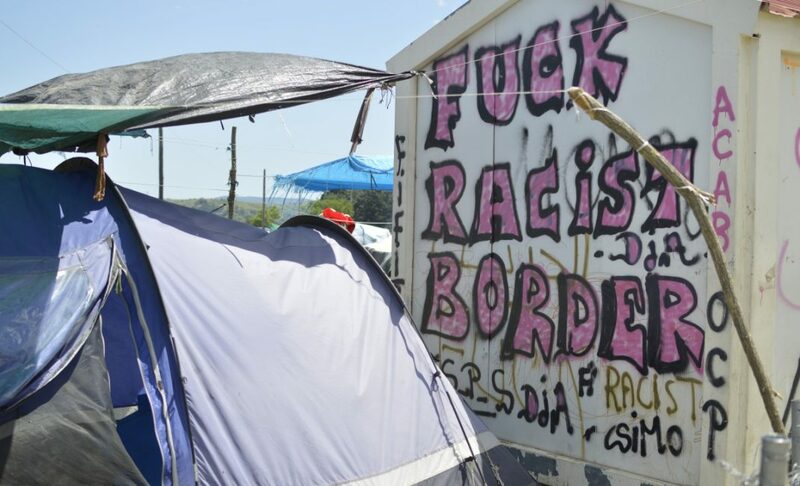 Conditions are supposed to better than Idomeni, but several sources, such as volunteers and the refugees themselves, have posted photos of the new camps on Facebook and Twitter, showing the opposite. 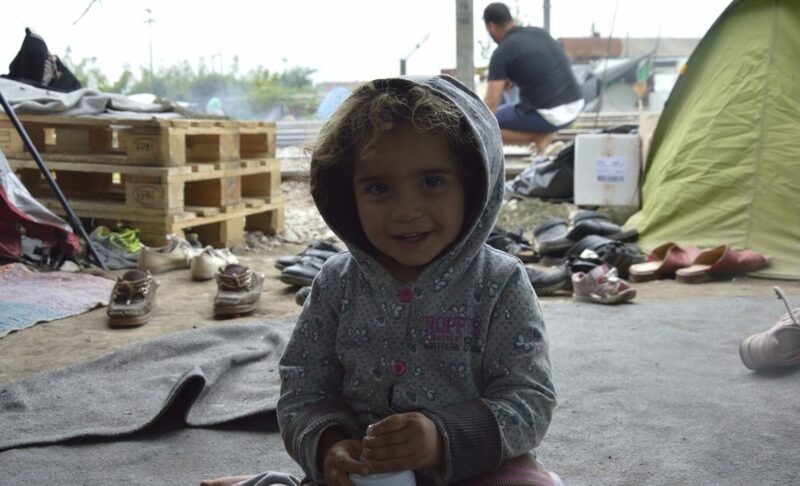 What was the general mood at Idomeni amid such harsh conditions? There was much hope. Every sentence ended with Inshallah (God willing). 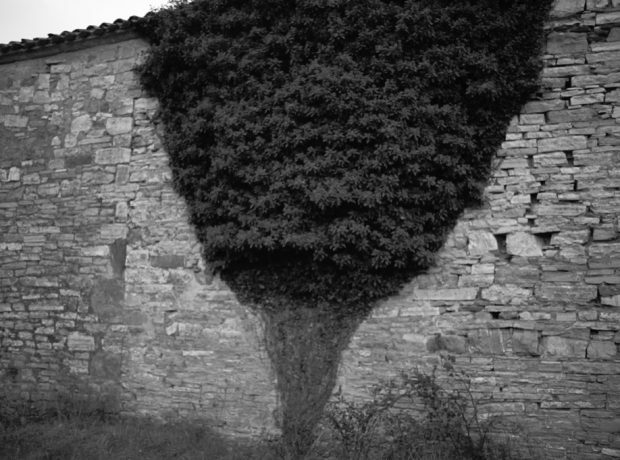 Though mingled with this hope was a sense of doom, everything was a mushkila (problem). Queues were a mushkila. There were unending queues for everything at Idomeni: food distribution, chemical toilets, springs to drink water or wash pots and dishes, and for cups of tea from the tents run by volunteers. The SolidariTea was a big tent with two entrances, one for ladies, one for gentlemen and a common exit. Inside the tent was a long table and behind that volunteers boiled water in huge pots on burners. In one of the queues I met Shadi, a 27-year-old Syrian from a suburb of Damascus. 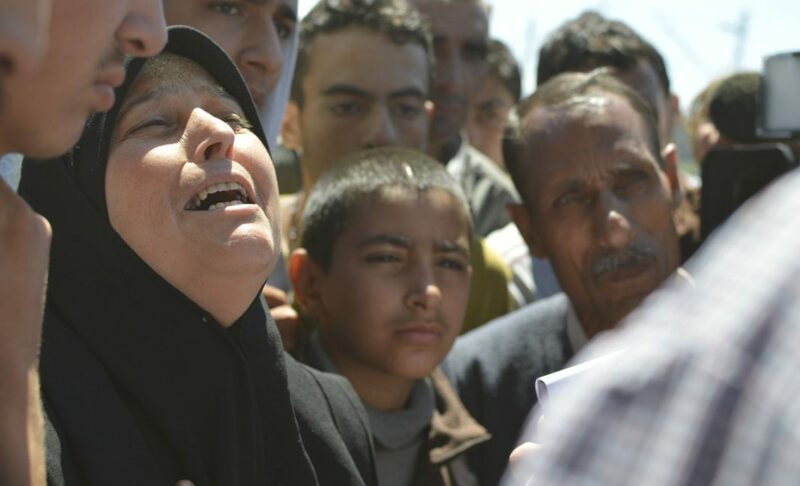 He left home with his mother and sister. The family had crossed the Turkey-Syrian border and from İzmir reached Greece by boat. 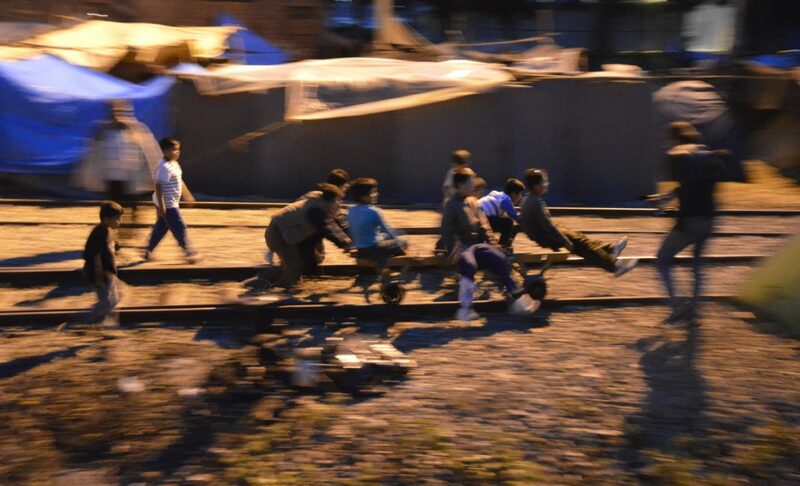 İzmir has become the Mecca for refugees trying to reach Europe. Most of Idomeni refugees travelled via the town paying smugglers on average $1000-2000 per person. Shadi was studying software engineering at university in Damascus, when the war broke out. “When I came to Greece by boat from İzmir my laptop got soaked as much as that I couldn’t use it more. And that was essential to continue my studies,” he said. Shadi asked me for a cigarette and bought us two beers from the coffee shop at the train station. From there we visited his living quarters. Shadi slept in a cot of an old train carriage with one friend. Two couchettes were set a few centimetres from the ceiling, just enough space for a person of average size. We sat on the seats looking out the window of the compartment, sipping the beers and smoking cigarettes. “You are very lucky to sleep here,” I said to Shadi. He agreed. Sleeping in a train carriage was classy at Idomeni. Most of the refugees lived in tents set long the border or on the banks of the railway at Idomeni station, where several empty carriages offered better refuge. Abdel, 20, from the north Syria, lived in a tent on the railway of Idomeni Station. He studied physics before he fled the country and wants to reach his cousin who lives in Amsterdam. “I can’t stay here. I want to continue my studies,” he said. Abdel’s plan was originally to cross the Greek-Macedonia border illegally because he had spoken with a friend who had successfully crossed this way. However, he eventually abandoned the idea because it was dangerous and expensive. Instead Abdel moved to Oreokastro military camp, which is in a former tobacco factory near Thessaloniki. I spoke to him via WhatsApp after the move. “Here is better than Idomeni. It’s very big. Tents are inside the building. So no hot sun, no wind, no rain,” said Abdel. At the new camp, Abdel has begun volunteering with RefugeesTV, a citizen journalism project created by two refugees, Basel and Mahmoud. Initially, they couldn’t afford real equipment, so they built props themselves. The microphone was a tea cup covered with domestic Syrian socks and a cardboard box and an empty bottle functioned as a camera. Within a few months, they received a real camera and microphone, and organized the first edition of Refugees Got Talent in the camp. 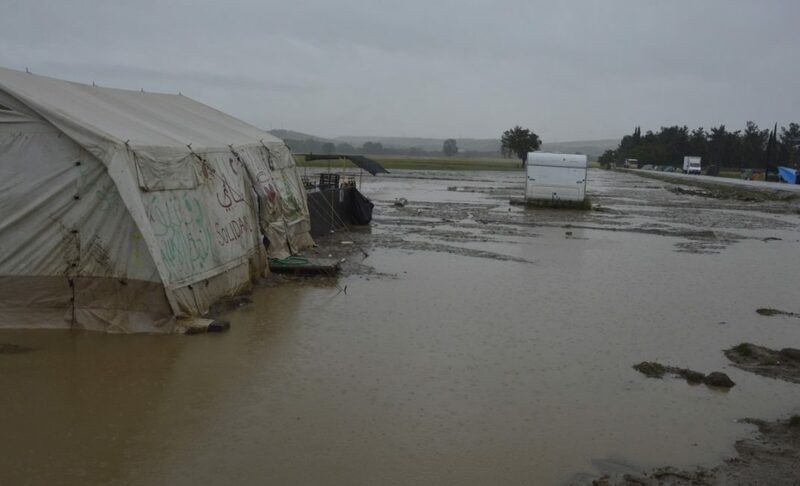 In the months leading up to the evacuation of the Idomeni camp, conditions grew worse. The cold and wet weather made people ill, sectarian tension between Kurds and Syrians was growing and the uncertainty of the situation made people feel increasingly desperate. The ban on volunteers dampened the mood and removed essential moral and practical support. People were frustrated at the lack of political progress from the European Union in remedying the crisis. Refugees in the camp asked me if there was any possibility that borders might open again. I couldn’t say yes, that would have been a lie. But it was difficult to say no and destroy any slither of hope they had left. “Europe, no good” was the most common sentence I heard from people, who were all at once in a constant state of nervousness, consumed with frustration, boredom, only sustained by the hope and survival instinct that had guided them during their journey so far. Ahmed sold everything he owned in Syria to pay for the journey to Europe. 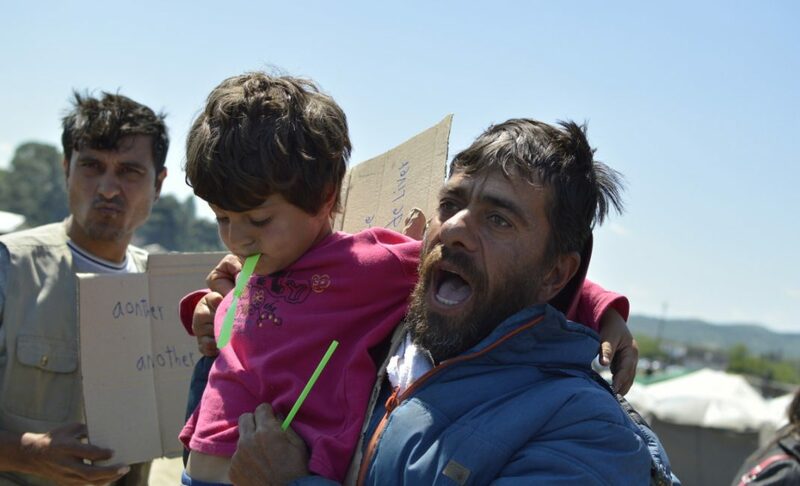 He paid around $600 to cross the Turkey-Syrian border and $5,000 to reach Greece with his wife and his 4 children. As the Idomeni camp emptied, other illegal camps close to the Macedonia/Greece border have grown. 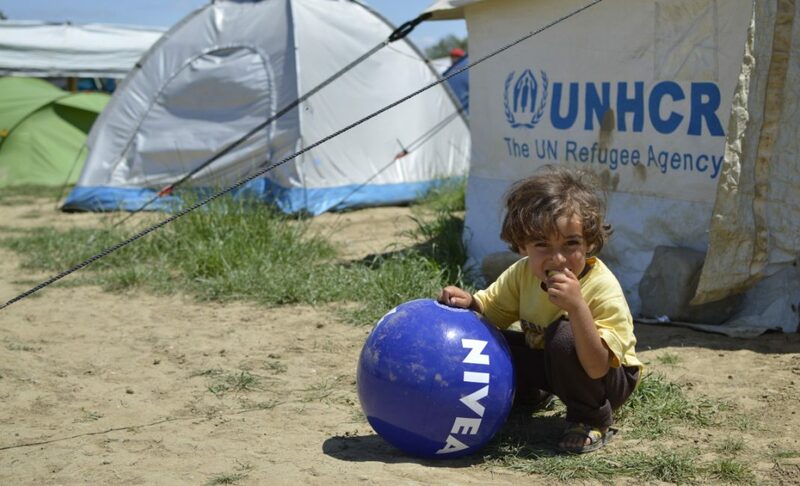 In addition to the smaller camps, there is an official camp in the area called Neo Kavala, near Polykastro. There I met Muhammed, an old Syrian man with grey hair and green eyes. Muhammed had lived in the camp for three months. One of the small hotels in Polykastro had become a hub for volunteers and refugees from Neo Kavala, who used the hotel to charge their phones, connect to the Wi-Fi connection, or to chat with volunteers and hosts of the hotel. Muhammed introduced himself and offered me a cup of Arak, an alcoholic drink with a high alcohol content, typically made from grapes, dates, sugar, plums, figs and molasses. It is colourless, but when you add water and ice it turns white, like milk. Muhammed added lemonade instead. He didn’t know a word in English, so we talked through Google Translate, a common custom between refugees and volunteers. Unable to pay smugglers for the crossing between Turkey and Greece, Muhammed drove the boat instead, which entitled him to a reduced fee. Muhammad was depressed. He was always with an Arak or a beer. The alcohol helped him to forget everything. He wanted to get back to Tukey to his wife. He realized that he couldn’t do anything here in Greece. In Turkey, he might find work and save some money, as well as be reunited with his wife. One night, I sat outside the hotel using the Wi-Fi connection and Mohammed appeared complaining of an aching tooth, he had a beer in his hand. He wanted to earn money to get back to Turkey illegally. “I am selling some stuff. Are you interested in that?” Muhammed said to me touching his black leather jacket. 50 euros. He wanted to sell even his smartphone. He was drunk, his teeth sore and desperate. It upset me that Muhammed was desperate enough to sell his smartphone, the lifeline of every refugee. This device represents an important resource for their journey. They use it to stay in touch with relatives, translate and speak with foreigners, be informed about what is going on, look something up online. Ordinary things that become crucial for survival. Even at Idomeni this was important. There was a medium-range Wi-Fi connection in one part of the camp, under an old rusty cistern. Beneath the cistern, crowds came and went to use the connection, calling friends and relatives. You need a phone to claim asylum too. To claim asylum in Greece you have to call a Skype account managed by the Greek Asylum Service. The problem is that there is just one Skype account for each language spoken and the account is only active three to four days a week. Thousands of refugees are trying to call this account every hour and very few get through to book an interview. Indeed, for most of the refugees I met, the Skype account hadn’t worked. For this and other reasons, many refugees give up applying. 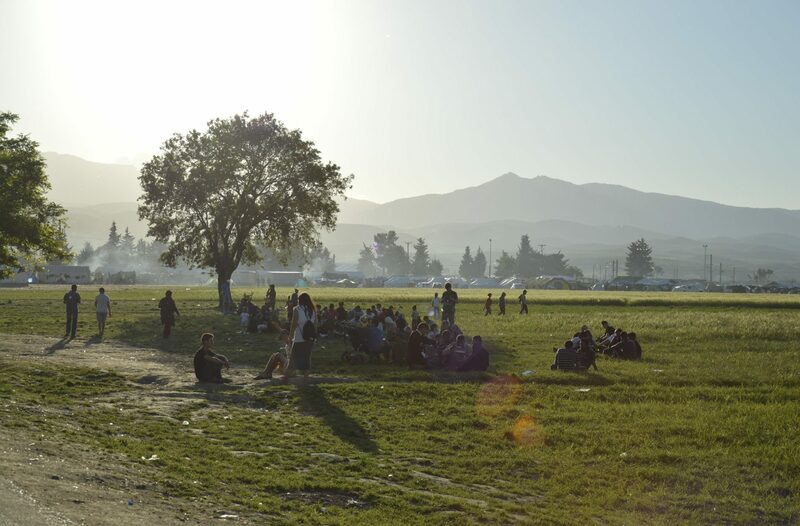 On 24th of May 2016 the evacuation of Idomeni began. The 8,000 people living there at the time were bussed to military camps across Greece. There were few journalists or NGOs to witness events, and the Greek police deployed thousands of officers, including 700 riot police to clear the village. The operation took two days. 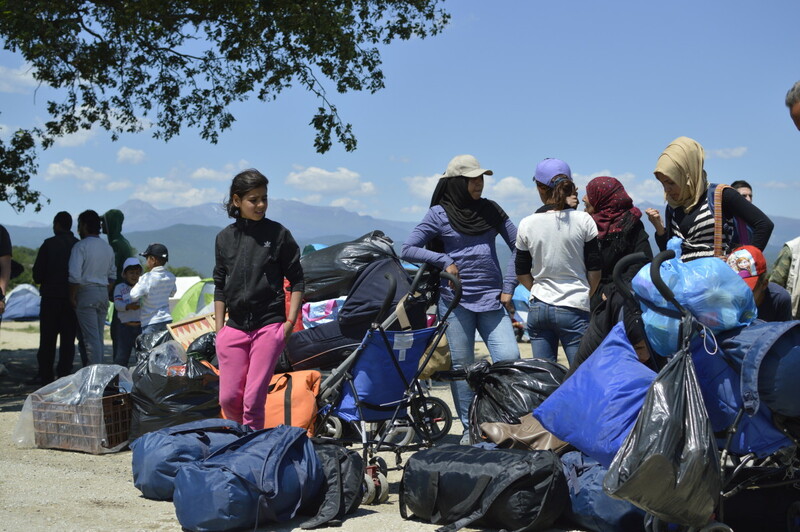 Idomeni slowly unravelled. Small makeshift shops selling everything from cigarettes to falafel and bread disappeared. The refugee barbers who worked under a wooden hut disappeared. The queues for essentials became one large queue for the exit of the camp. I interviewed a young group of Syrian refugees the night before the evacuation. They lived in an abandoned two-floor dwelling close to the train station. I called this building, the Boxers House because one of them was a professional boxer and the others boxed for fitness. They invited me to train with them. We talked, laughed and shared tips about boxing. Then, we went upstairs to dine. We ate a type of Mansaf, which is a traditional Arab dish made of lamb and rice with vegetables. We discussed the living cost in Europe and why I am unmarried. Khalid, 27, has two children and my lack of a wife was strange to him. After dinner, the tone grew serious and the men began to discuss their options once the evacuation had taken place. I stayed at Boxer House that evening, to witness the eviction the next day. In the morning, I was woken up by a police helicopter flying low over the camp. I went out to the courtyard and I met a man who I had never seen before. “Are you a journalist?” he said, mumbling some English words. I said “yes” and he told me to be careful because the camp was surrounded by police, riot police and even police officers in civilian clothes. I thanked him for this information and headed to the tents set on the rails. There, I met a group of Spanish volunteers disguised as refugees who wanted to hide from the police so they could help a family. “Do I look like an Arab woman?” asked a young woman with a hijab twisted on her head. “Yes, just cover a bit more your hair,” I replied. I wore a black coat beneath which I hid my camera, a backpack and a sleeping bag. I was a clear target for the police. Refugees packed their belongings in shopping carts and pushed them to the buses waiting to transport them to military camps. I noticed another group of Syrian refugees including a crying girl, a Syrian woman with a hijab and others climbing on board a bus. One of the group was actually a volunteer, who was helping the family to pack up and find normal accommodation, so that they would not have to stay too long in the military camp. I snapped photos and walked briskly along a path leading to a farm where I had arranged to meet some Kurd friends. Suddenly, a hand touched my shoulder. He was a police officer in civilian clothes. I was questioned for two hours at the police station, and then after checking my documents I was released. 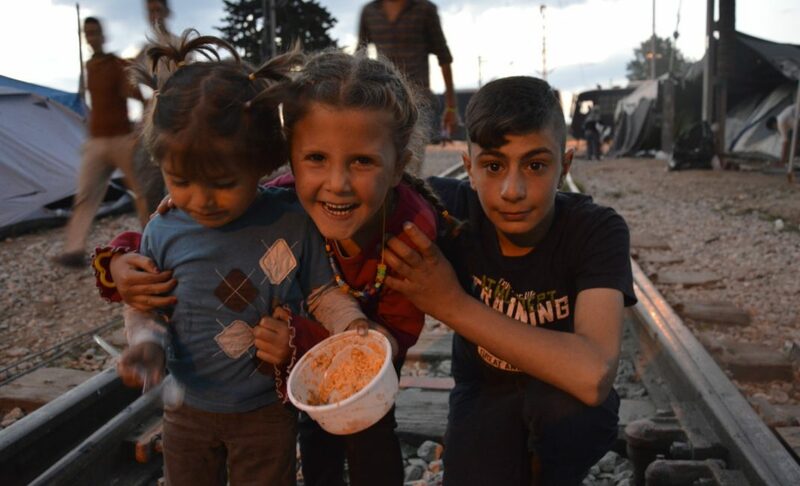 That day more than 2,000 Idomeni refugees left the camp and the rest were transferred to the military camps. Idomeni is over. Later, I discovered Khalid and his friends in another abandoned house outside of Idomeni. They didn’t know what to do or where to go. They invited to me to come for a boxing workout in their new temporary house, as they waited for the next turning point in their lives. In 2016 so far, more than 158,000 refugees reached Greece and almost 58,000 refugees are living in the country. 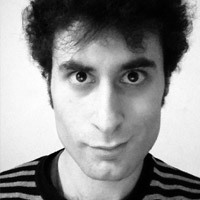 All photos by Dario Sabaghi.